Heavyweight contender Jarrell ‘Big Baby’ Miller 22-0-1 (19) called out the big names in the division at a press conference on Saturday to announce his upcoming fight against Bogdan Dinu 18-0 (14) for a minor WBA title at the Kansas Star Casino in Mulvane, Kansas on November 17 to be broadcast live on DAZN. The Matchroom Boxing card is part of British promoter Eddie Hearn’s push into the lucrative US market. 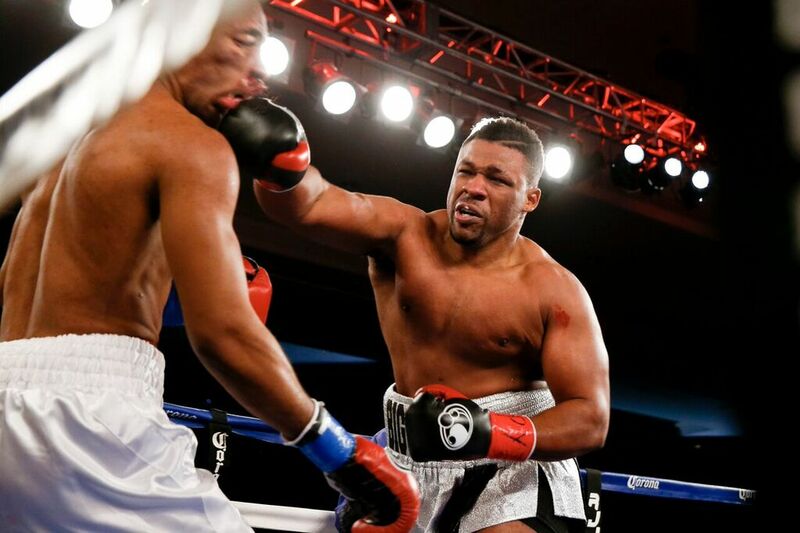 The untested Dinu of Romania will be taking a big step up in class against the highly regarded Miller, who is being touted as a future heavyweight champion. “Credit to Bodgan for taking the fight – I’m fighting people I have no animosity to!” said the 300-pound Miller. “He’s undefeated, he’s been in camp for a fight last weekend, so I know he’s in shape. “It’s been a long journey to get to where we are today, I’m finally at the stage where I am getting that title shot and being in a place to fight the big guys. “The proof is in the pudding, being big is not a crime. Big Baby is big and I’m going to keep throwing big punches and getting big wins. “I’m finally getting the chance to headline a big card thanks to Eddie and Matchroom and I am going in for the kill. The fight against the undefeated Dinu will top a start-studded bill that also includes the return of former lightweight titleholder Brandon ‘Bam Bam’ Rios 34-4-1 (25) against Ramon Alvarez 27-6-3 (16) at welterweight. Two-time Olympic gold medallist Claressa ‘T-Rex’ Shields 6-0 (2) will be defending her WBA and IBF middleweight crowns against Scotland’s Hannah Rankin 5-2 (1) with the vacant WBC title also up for grabs, while middleweight fringe contenders Luis Arias 18-1 (9) and Gabriel Rosado 24-11 (14) will be looking to gatecrash the world top 10 with a win in their 10-round fight. Team USA 2016 Olympic bronze medallist Nico Hernandez 5-0 (4), a native of Wichita, will also feature on the card in his third fight at the venue since debuting there in March last year when he takes on Joshue Morales 8-7-3 in an eight round special attraction. “I watched Nico Hernandez box in Kansas on YouTube and I saw what we love at Matchroom Boxing – passion, excitement and a city that is behind the sport and their fighters,” said Hearn. The venue will be configured to host 6,000 fans and Hearn believes it will be a sell-out. “We’ve got about 6,000 seats to sell, and I believe we’re going to sell every one of them,” he said. “This is part of our plan and process, to go to cities where we can get excitement. “We’ve been to Chicago and Boston and they were great, people are happy that we are there and thanking us for bringing boxing to those cities.